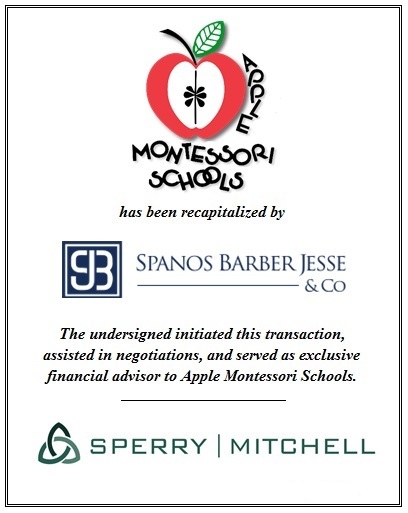 New York, NY (September 11, 2018) – Apple Montessori Schools of Riverdale, NJ (“Apple”) has been recapitalized by, and partnered with, Spanos Barber Jesse & Co. of Walnut Creek, CA (“SBJ”). Sperry, Mitchell & Company initiated this transaction, assisted in the negotiations, and served as exclusive financial advisor to Apple. Morgan, Lewis & Bockius served as legal advisor to Apple. McGuireWoods served as legal advisor to SBJ. Apple Montessori Schools (www.applemontessorischools.com) is one of the most established and successful early childhood education and enrichment providers in the New Jersey/Metro-New York City market. Since its inception, Apple has grown to fifteen locations, with the goal of continuing to expand its footprint of schools with its research-proven approach to whole-child education and development. Apple’s unique and proprietary Montessori Plus curriculum and programs are built on the foundation of Montessori education, which values individual and independent learning at one’s own pace, and respects a child’s natural cognitive, psychological, physical, and social development. Apple offers Infant, Toddler, Preschool/Kindergarten, and Elementary School programs, along with Summer Camp, Before & After School, and Core Enrichment programs, reaching children aged 6 weeks to 12 years. Apple’s curriculum and programs address a child’s critical early learning years and foster a lifelong love of learning. Spanos Barber Jesse & Co. (www.sbjcap.com), is a private investment firm with approximately $300 million of committed capital. SBJ focuses on lower middle-market consumer, business services, and healthcare services companies. SBJ provides flexible capital solutions, thoughtful strategic advice, and domain expertise to support the value-creation goals of entrepreneurs, owners, and management teams. 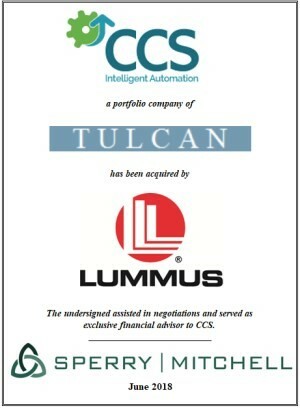 The firm’s founders have invested over $500 million in more than 35 companies with a demonstrated track record of success. Sperry, Mitchell & Company (www.sperrymitchell.com) is an investment banking firm specializing in sell-side middle-market merger and acquisition advisory services. Since the firm’s founding in 1986, Sperry, Mitchell & Company has completed over 350 transactions in a wide range of industries, with values ranging from $10 to $450 million. http://www.sperrymitchell.com/wp-content/uploads/2016/01/SperryMitchell_logo4.jpg 0 0 Sperry Mitchell http://www.sperrymitchell.com/wp-content/uploads/2016/01/SperryMitchell_logo4.jpg Sperry Mitchell2018-08-16 19:50:552019-01-10 21:28:36Sperry Mitchell Advises Apple Montessori Schools On Its Recapitalization by Spanos Barber Jesse & Co.
New York, NY (August 8, 2018) – Water-Land Manufacturing, Inc. d/b/a Continental Trailers and Waterland Supply Co., Inc. (collectively “Waterland”) of Doral, FL have been acquired by KODA Enterprises Group (“KODA”) of Waltham, MA. Sperry, Mitchell & Company initiated this transaction, assisted in the negotiations, and served as exclusive financial advisor to Waterland. Water-Land Manufacturing, Inc. d/b/a Continental Trailers (www.continentaltrailers.com) is a leading marine trailer manufacturer that maintains long-term relationships with its core customer base of boat dealers & manufacturers, trailer dealers, and marine accessory dealers. Continental Trailers’ product line spans a wide spectrum of trailers for saltwater boats, personal watercrafts, jet skis, pontoons, catamarans, Jon boats, skiffs, kayaks, and canoes. Waterland Supply Co., Inc. is a leading wholesale distributor of aftermarket parts and accessories for marine trailers, serving customers in Florida and internationally. KODA Enterprises Group (www.koda.com) is a middle market private investment firm that concentrates on companies in niche markets that have the potential to benefit from the financial strength and operational expertise KODA provides to its portfolio companies. Dan Officer, Managing Director, was featured as ACG New York’s member of the month in March of 2018. He has been a member of ACG New York since 2013 and recently served as Vice Chair for their Manufacturing Conference, which was held in New York City. We are pleased to announce the promotion of Alexander Coggin and Kyle Morgan to Associates. Alex is primarily focused on company, transaction, and market analysis for potential and current clients, as well as providing overall sale process support. Prior to joining Sperry, Mitchell & Company, Alex held positions with Keefe, Bruyette & Woods and Fidelity Investments. Alex graduated from Trinity College with a degree in Economics. Kyle Morgan is primarily focused on company, transaction, and market analysis for potential and current clients, as well as providing overall sale process support. Prior to joining Sperry, Mitchell & Company, Kyle worked for Oppenheimer & Company. Kyle graduated from Johns Hopkins University with a degree in Economics. During his time at Johns Hopkins, Kyle played wide receiver for the football team.